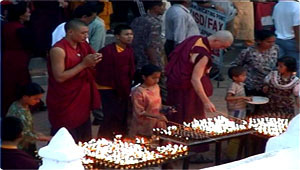 The ever benevolent Buddha was born in Nepal, and the religion he preached is the, second most popular in the kingdom. On May 6, a full moon day, the Lord's birth, enlightenment, and salvation are applauded throughout the valley with celebrations. Swayambhu and Boudhanath Stupas are prepared for the oncoming festivities several days in advance. Monasteries are cleaned, statues are polished, bright prayer flags waft in the breeze, and monks prepare to dance. On the Jayanti day, people reach the stupas before dawn, go around them and give offerings to the many Buddha images there.